As Jeremy Corbyn defies party vote calling for him to resign, Labour risks splitting in two. Will anti-Semitic extremists prosper? (JTA) Only a week ago, Jeremy Corbyn seemed to have survived his biggest public relations debacle as the leader of Britain’s Labour Party: the proliferation of anti-Semitic rhetoric among its members. Yet this week, the British vote to leave the European Union achieved what Corbyn’s opponents failed to do in their attacks against him over anti-Semitism. On Tuesday, 172 Labour lawmakers among the total 229 in the Parliament said they had no confidence in Corbyn, opening the door to a challenge that if co-signed by 51 lawmakers will lead to internal elections. The previous day, the party’s leadership abandoned Corbyn in a mass walkout over his perceived failure to effectively lobby against the Brexit, which a majority of voters supported in a June 23 referendum. Relying on strong popular support in the Labour rank-and-file and ignoring calls to resign by former supporters who quit in protest of his leadership, Corbyn is holding on to his seat. Critics say he risks splitting and ruining a party that used to be a natural political home for British minority groups, including many from the Jewish community. On Monday and Tuesday, 24 Labour shadow ministers – senior lawmakers who hold key portfolios within the opposition party – resigned their roles, citing Corbyn’s handling of the Brexit vote. A former Euro-skeptic, Corbyn led a "stay" campaign that was so lackluster and low-key that he faced accusations within his party of deliberately sabotaging the party position. Prime Minister David Cameron, a Conservative who campaigned vigorously for a stay vote, announced his resignation following the referendum’s result, citing a need for leadership that reflects the will of the majority of British voters. Corbyn, however, dug in his heels. After the walkout and no-confidence vote, he issued a defiant statement saying he would not betray those who voted for him by resigning. “I was democratically elected leader of our party for a new kind of politics by 60% of Labour members and supporters, and I will not betray them by resigning. Today’s vote by MPs has no constitutional legitimacy,” he said. Among the Labourites bolting over the Brexit issue was Luciana Berger, a Jewish lawmaker who had resisted repeated calls by Jews and non-Jews to distance herself from Corbyn over the anti-Semitism issue in the party. Like other senior Labour lawmakers, Berger stuck with Corbyn throughout the anti-Semitism controversy “because she wanted to make a difference in her field of political engagement,” David Hirsh, a British Jewish columnist and prominent sociologist at the University of London, told JTA. With the Conservative Party in turmoil over Cameron’s resignation, elections may be around the corner, possibly this year. Corbyn is widely seen as too radical to be voted into a position of power. “Corbyn cannot win a general election, so Labour politicians no longer feel they have the luxury of waiting to see what happens. They feel they need to act now,” Hirsh said. The attempted coup against Corbyn comes amid a widening split within Labour between its moderate center and the left-of-center camp supporting Corbyn. A hard-core socialist who has major traction with anti-establishment voters, Corbyn used to vote left of Labour before he came to lead the party. His rise within Labour coincided with an influx into the party of tens of thousands of his supporters – a process that many observers said also led to the proliferation of anti-Semitic speech and conspiracy theories. 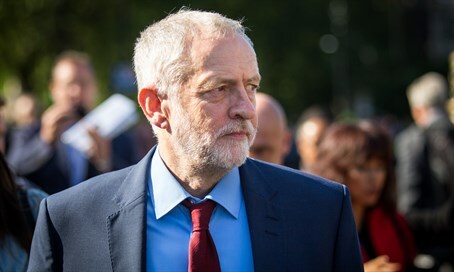 Under fire by senior party members who accused him of either doing too little to curb the phenomenon or of contributing to it with his open endorsement of anti-Israel terrorists, Corbyn took a serious beating in the mainstream media. The pressure mounted after Ken Livingstone, a former mayor of London, said Adolf Hitler was a Zionist. Livingstone was suspended from the party. Hirsh said the influx of left-of-center supporters may mean that Corbyn is correct in asserting that he represents the majority of Labour members. But the growing gap between his supporters and a substantial part of Labour’s leadership and establishment risks tearing apart Labour, splitting it into centrist and radical factions, he added. The concern over a split in the Labour Party into a radical and moderate wing also exists for the Conservative Party, which is also divided on the Brexit issue. If radical Conservatives prevail, it will be at the expense of Cameron’s camp, which many British Jews credit with leading an essentially liberal democratic line and resolute opposition to racism. A right-of-center victory could encourage xenophobia – a prospect the Board of Deputies of British Jews already warned about in the wake of the Brexit vote. Corbyn himself has stressed that he rejects all forms of racism, including anti-Semitism. But like many British Jews and the community's leadership, Hirsh insists that "the Corbynite wing of the Labour Party carries anti-Semitic ways of thinking." To the extent that it is successful in mainstream politics, he added, "it will carry that with it into British political life."